The month of January was a busy one for us. We finished our stay in Kiveri, Greece, spent one week in Israel, 10 days in Jordan, and then flew to Bangkok, Thailand. 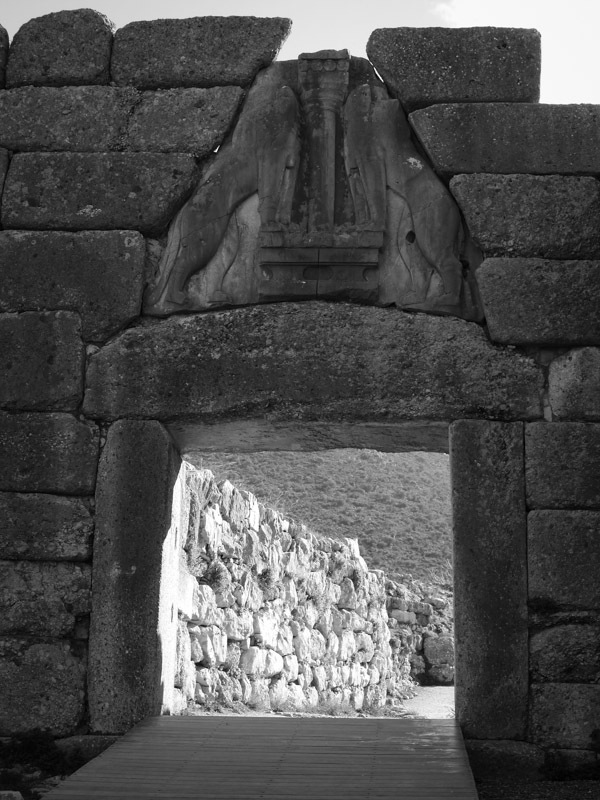 During the month of January, we saw some amazing places and also learned a little about the history along the way. So how did we do with visiting so many places? Sadly to say this has been our worst month yet since starting our around the world adventure. Our total expenditures for the month of January were $5,791.06 or $186.81 per day or $62.27 per person per day. Yep, you read that right. We didn’t even come close to our budget of $100 per day. Several things contributed to us going over budget including a big jump from the Middle East to SE Asia and some splurges like spending 2 nights in a Bedouin camp and 2 nights on the Dead Sea in a resort. We were also caught off guard by how expensive Israel was, which I will detail later in this post. For the month of January 1.36 USD equaled approximately 1 Euro, 1 USD equaled approximately 3.49 Israeli Shekels, 1.41 USD equaled 1 Jordanian dinar and 1 USD equaled 32.97 Thai Baht. Not surprisingly our biggest expenditure for January was for transportation given we had a big jump from the Middle East to SE Asia. Our total expenditures for transportation were $2,107.52. While in Kiveri, Greece, we rented a car. Most of the car rental cost is reflected on lasts month budget. But for a matter of convenience we kept the car an extra day for a total of $20.40, which is reflected in this budget. The total fuel cost was $116 and tolls were $33.50. We flew from Athens to Tel Aviv, Israel. The cost of the flight was $320.83. 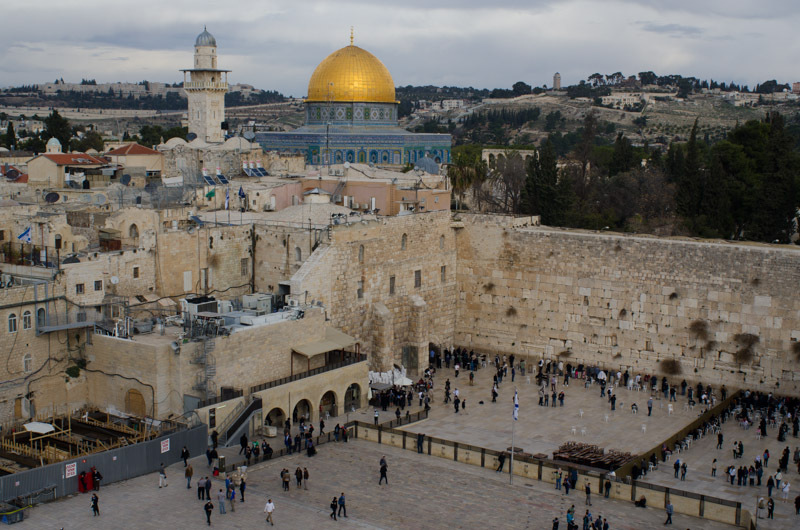 We took a shared van from Tel Aviv, Israel to Jerusalem for a total of $55.59 and then the bus from Jerusalem to Eilat, Israel for a total of $65.78. Due to the lack of consistent buses in Jordan and after looking at the cost of taxis, we decided to rent a car during our time in Jordan. A 10-day car rental in Jordan cost us $293. We also had to pay a hefty one-way rental fee of $49.44 to return the car at Amman airport as we picked it up initially in Aqaba. Our total fuel expenditure was $41.74 and we did not have to pay any tolls while in Jordan. Overall, driving in Jordan was easy, as main roads are well maintained. There are very few main roads, so getting lost is not an issue. We also found fuel to be relatively cheap. 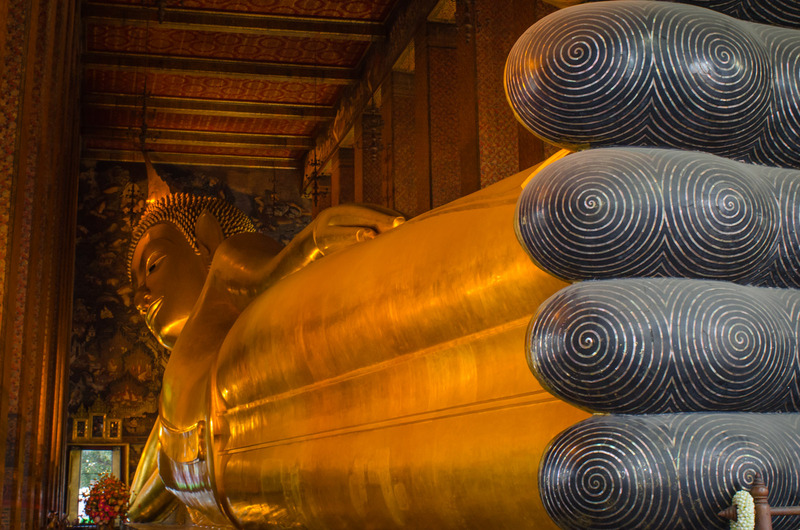 After our time in Jordan, we then flew to Bangkok, Thailand, which cost $1,023.97. I must say here, although we had to take 3 different airplanes to make it to Thailand, it was actually pretty pleasant. We flew on Etihad and SriLankan Airlines. I have not experienced airline services like this in a long time. They had free drinks, including alcohol, and meals and free movies. It felt luxurious compared to some of the other budget airlines we have flown while in Europe. Our total expenditures for local transportation were $87.27. Jerusalem has an excellent tram and bus system. Each ticket costs $6.90 shekels and is good for 90 minutes. But beware, don’t make the mistake we did. You can purchase multiple tickets at a time, but they are only good for the day they are purchased on. Also, if you get on the bus first, you cannot use the tram tickets for the bus. However the bus ticket works for the tram and the tram ticket will work for the bus if you validated it on the tram first and it is still within the 90-minute time frame. Did you get that? Our next biggest expenditure was for lodging. The total cost for lodging was $1,859.91. This is a lot more than we typically spend on lodging. Most of the time we will try to find apartments to rent, as apartments tend to be cheaper and help us save on food costs. However due to difficulty finding affordable apartment rentals while in Israel and Jordan, we stayed in hotels. We also found the lodgings in Israel, especially in Jerusalem, to be incredibly expensive and basic for the amount of money spent. While Kiveri, Greece we stayed in a lovely house along the Argolic Gulf, which cost us $411 for 10 days. 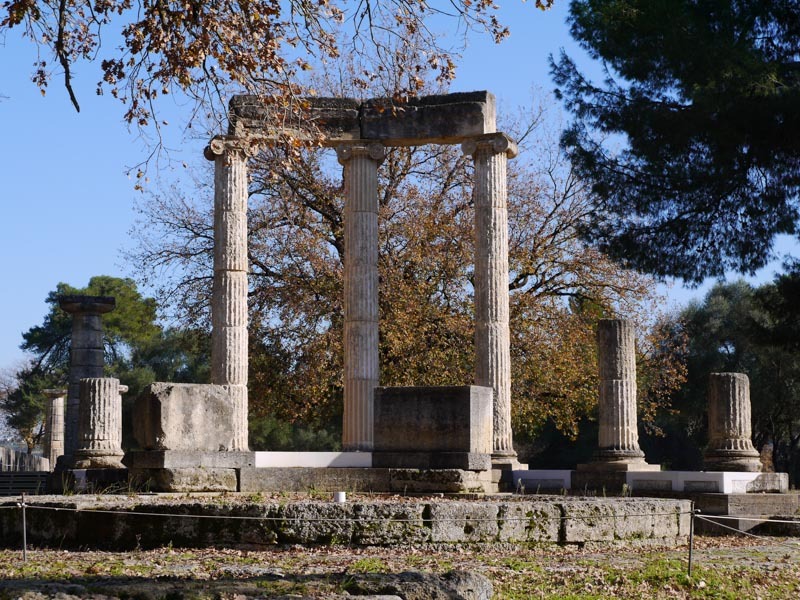 We then spent two nights in a hotel in Delphi, Greece for a total of $149.60 and one night in a hotel in Athens for a total of $43.62. 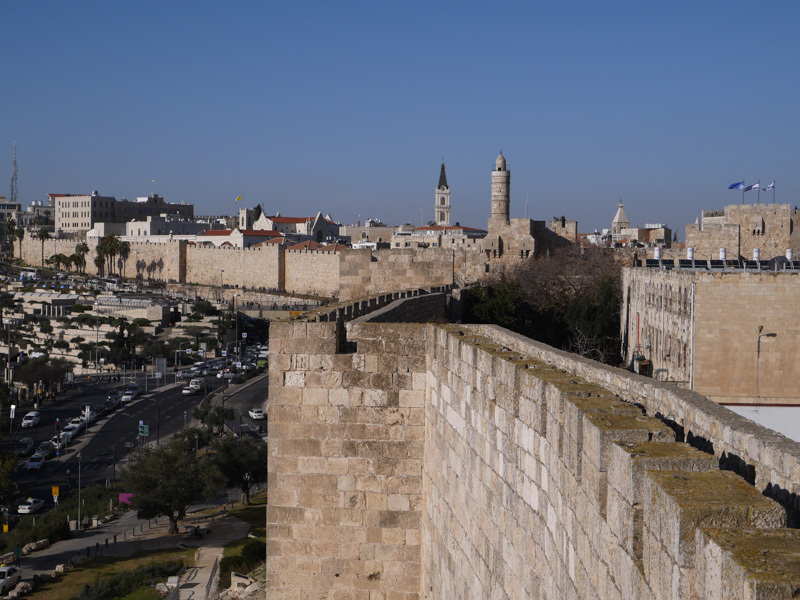 We then spent 4 nights in a guesthouse in Jerusalem for $350.72. The guesthouse included breakfast. We spent 2 nights in a hotel in Eilat, Israel for a total of $139.83. 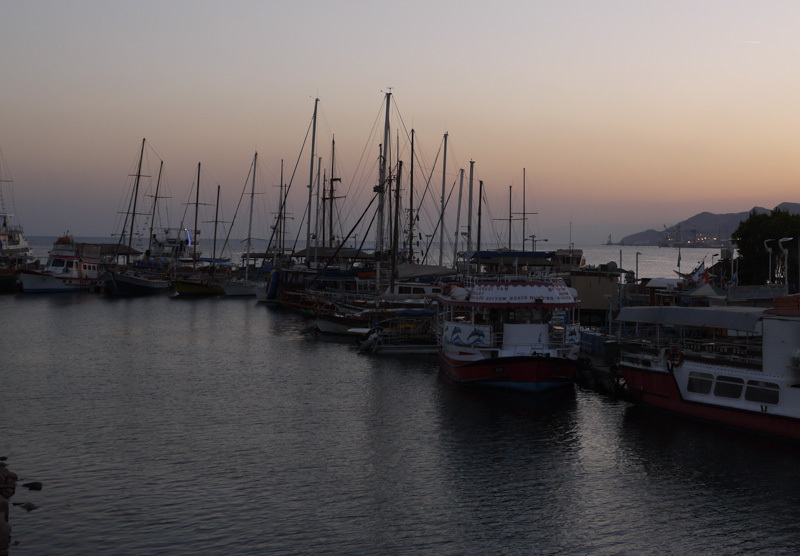 We then spent 1 night in a hotel in Aqaba for a total of $49.35. 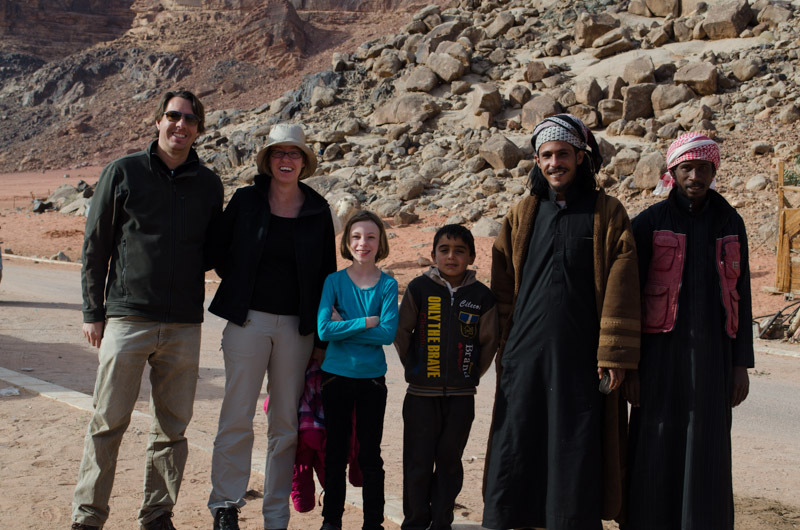 We spent 5 nights in Wadi Musa (Petra) for a total of $300.33. Breakfast and dinner were included in the cost. 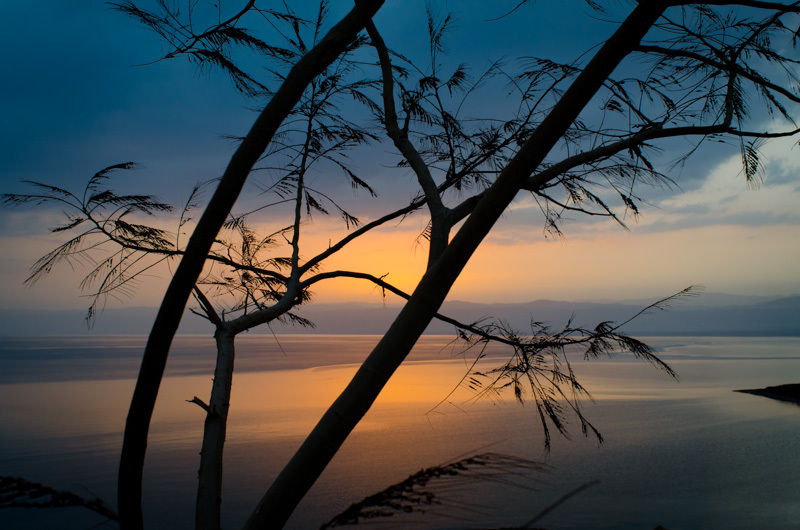 We then splurged and spent 2 nights at the Dead Sea in a 5-star luxury resort for a total of $283. A word to the wise here, always read the fine print. Initially it looked like the room at the Dead Sea would cost $100 a night, however, at checkout this bloomed to $141.50 per night. We also made the mistake of using our credit card. We have rarely used our credit card since leaving, preferring to pay with cash. However we were running low on money and decided to put it on our credit card instead. We made the mistake of having the hotel convert the charge to USD and they gave us a terrible exchange rate. 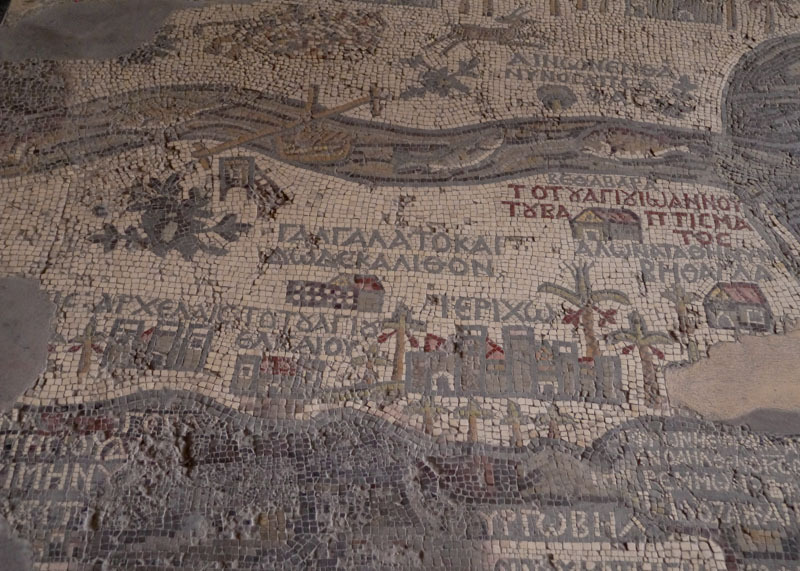 After the Dead Sea, we spent one night in Madaba, Jordan before flying out to Bangkok. Our hotel cost $62.04 and it also included breakfast. 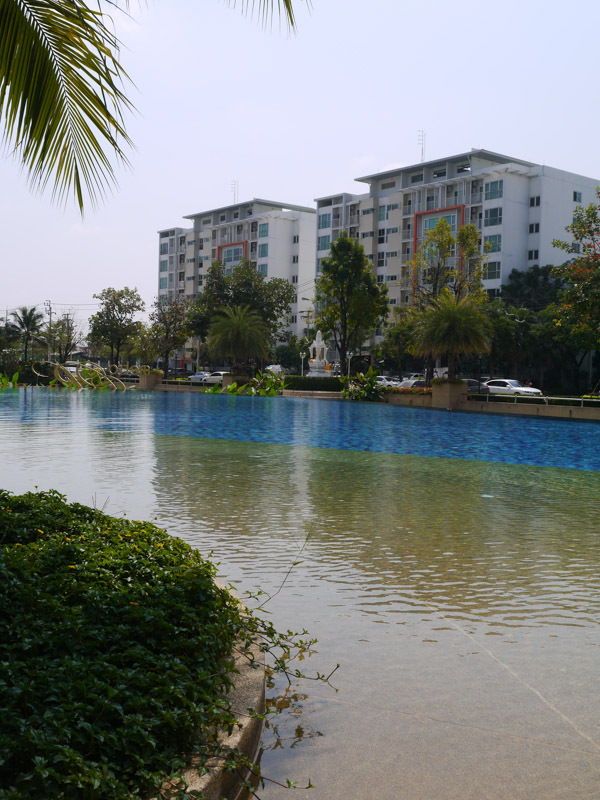 While in Bangkok, we rented an apartment for a week. Two of the nights are reflected on this month’s budget for a total of $59.42. We also had $10.60 in miscellaneous cost for laundry while in Jerusalem. Our next biggest expenditure was for food for a total of $775.50. We spent $432.11 on groceries and $343.39 for dining out. Our cost for dining out was higher this month, since we spent the majority of our time in hotels. 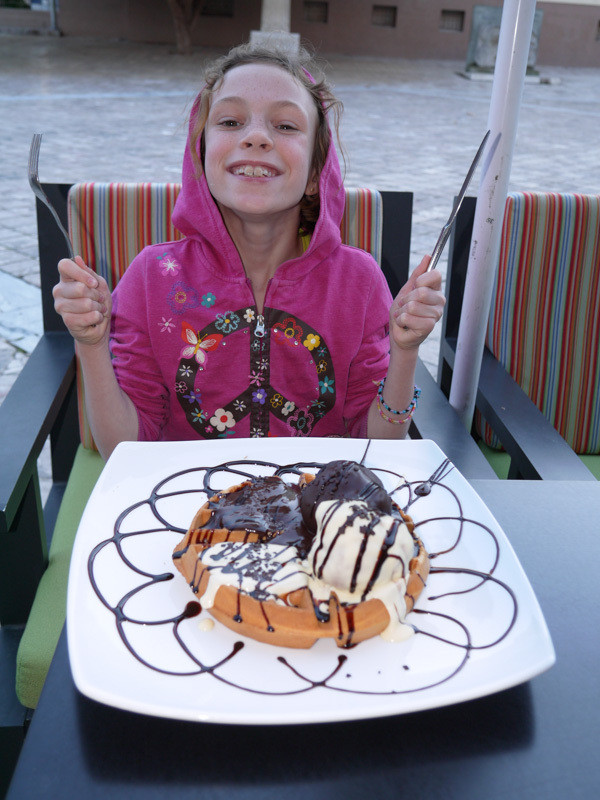 We found several hotels that included breakfast, which helped offset our food costs. 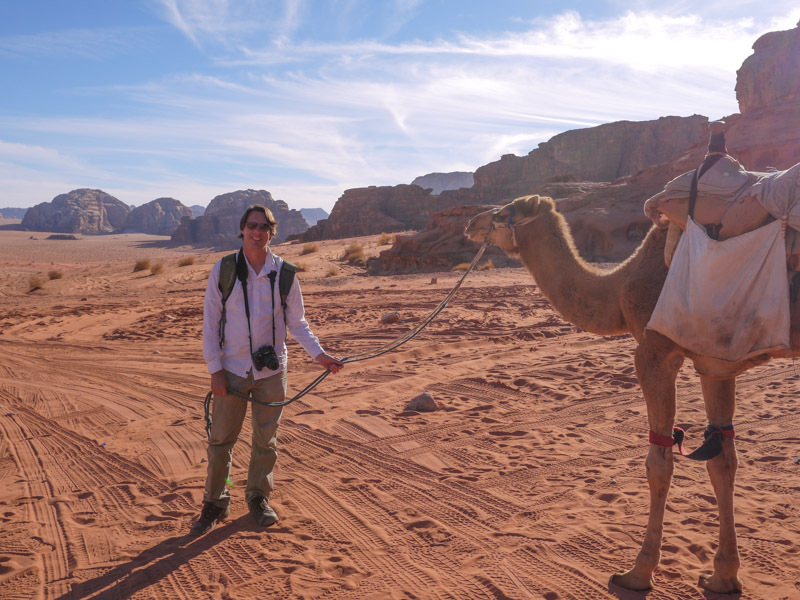 We added a new category this month, as I was not sure where to include our time in Wadi Rum in our budget. 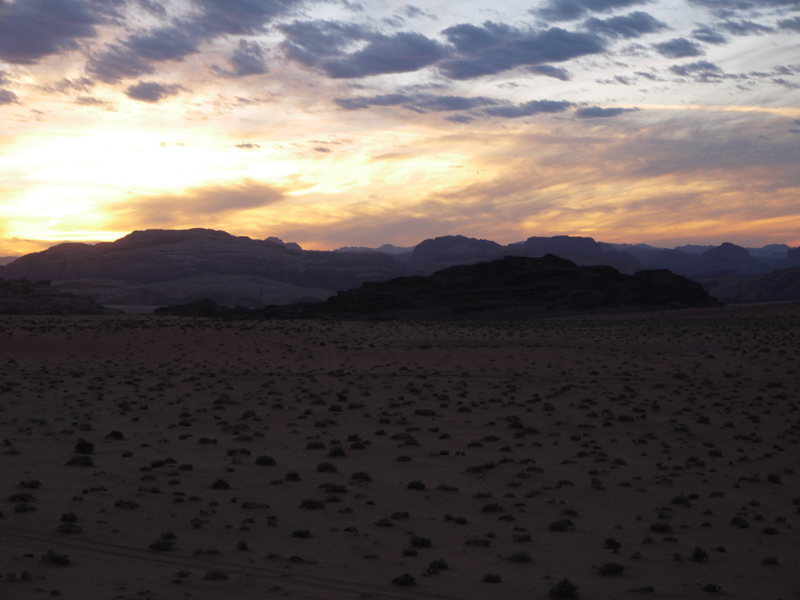 During our time in Wadi Rum, we spent 2 nights in the desert on a jeep/camel trek and sleeping in a Bedouin camp. The total cost was $423. Although this was expensive, it has been one of my favorite experiences since leaving on our around the world adventure. 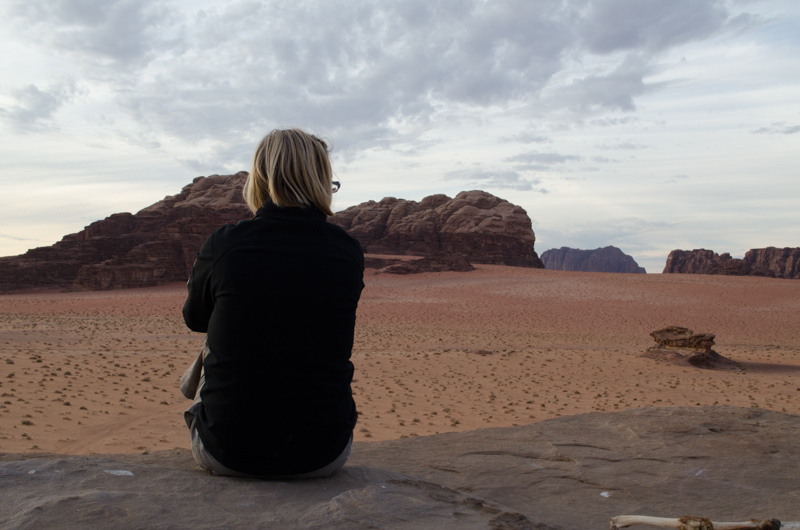 My only regret is we did not spend longer in Wadi Rum. We spent a total of $364.59 on entrance fees. 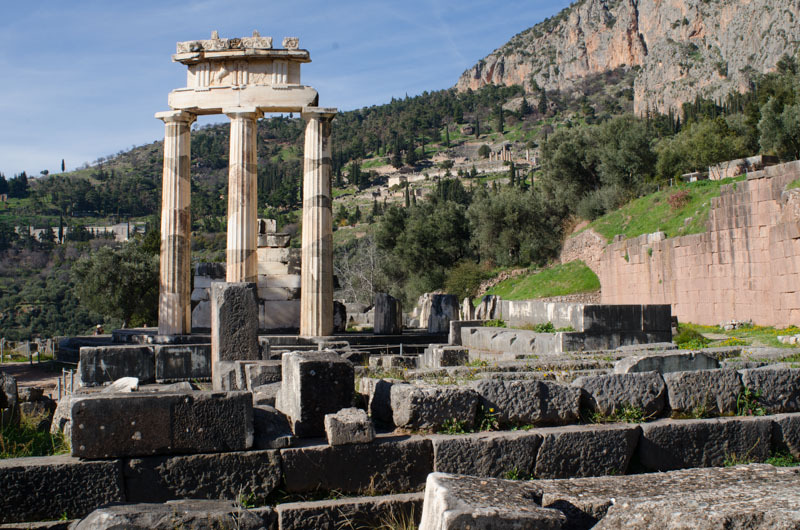 This included seeing Mycenae, Olympia, Lerna, Tyrine and Delphi in Greece, the City of David, Church of Ascension, Israel Museum, and walking the ramparts of Jerusalem. We also went to the Coral Beach Reef in Eilat, Israel and while in Jordan, we saw Petra, Church of the Map, and the Archeology Park. 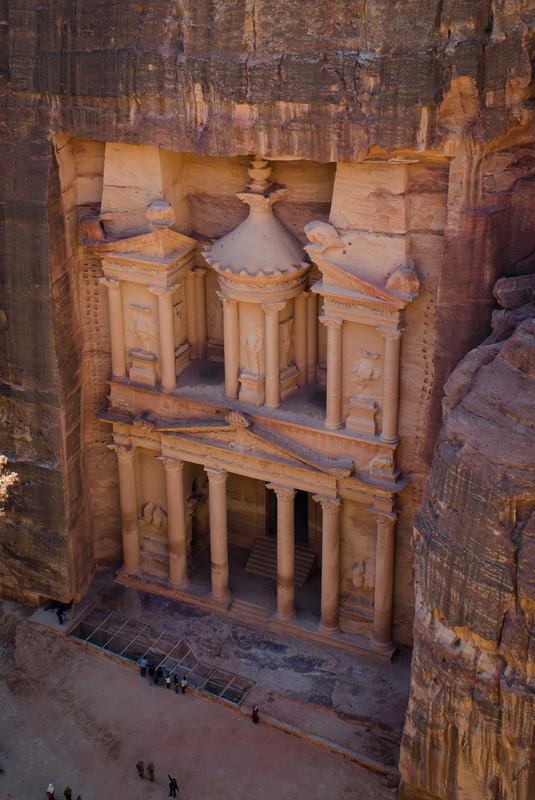 By far the most expensive site we visited in January was Petra. A 4-day pass cost us a total of $169.20. Despite the expense, it was well worth it. Petra is very large and really needs at least 2 to 3 days to be able to see it without exhausting yourself. 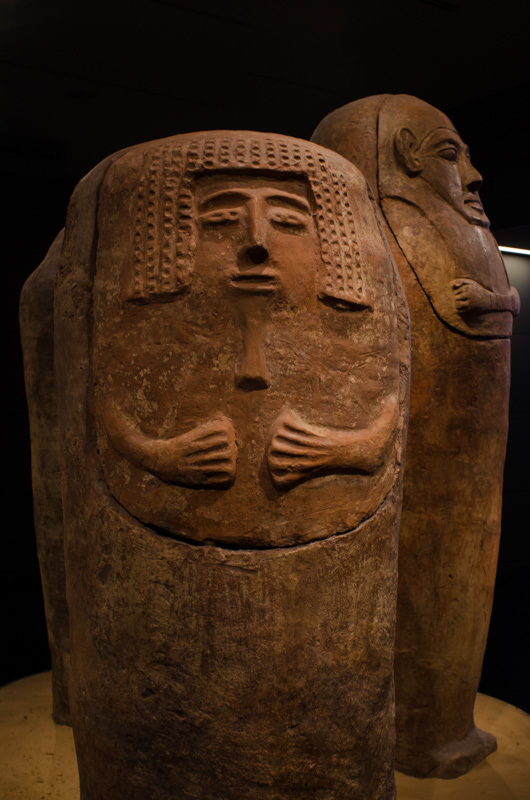 The other place that we found to be expensive, but still worth seeing was the Israel Museum. It cost us $35.82. 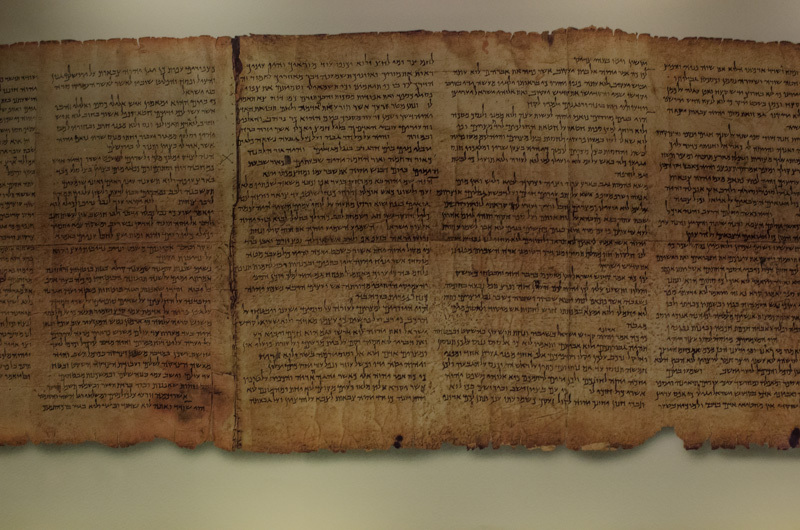 The Israel museum houses some of the Dead Sea scrolls and also has an amazing archeology collection. The only place we regretted going this month was to Coral Beach Reef reserve. I am sure it is fantastic place. However, due to limited time, we did not go on an ideal day. The day was really windy making the water very choppy. It was difficult to snorkel, as the snorkel gear that we had did not have a one-way valve. Jason and Sydney got a mouth full of salt water. 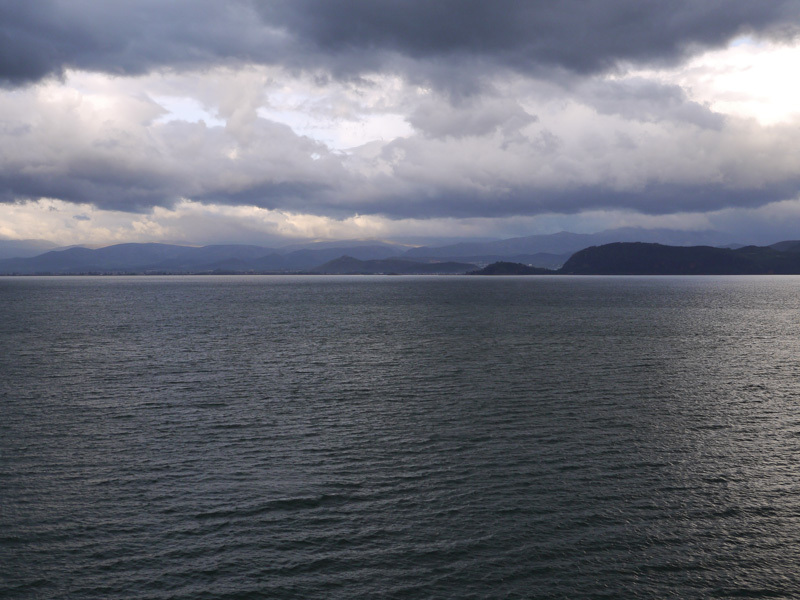 It was also very difficult to swim in the swells. Our total expenditures under miscellaneous were $107.21. This including shipping a box full of journals home, a gift, and playing air hockey in Eilat. Our total expenditures under communication were $33.56. This includes the cost for postcards and stamps. For entertainment, our total expenditures were $25.16. 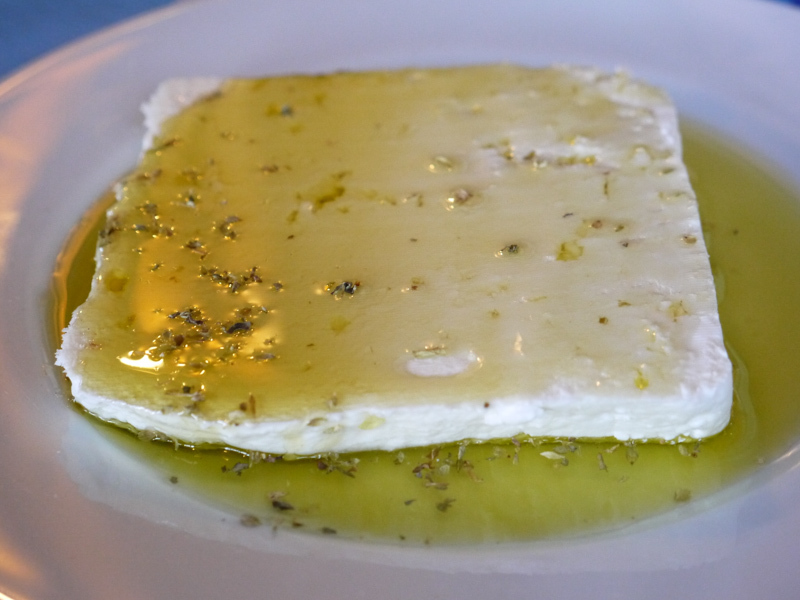 This included a boat ride in Nafplio to the fort in the harbor and a walking tour in Jerusalem. The boat ride was okay, but would I probably not pay for this again. Although we enjoyed seeing the sites of Israel, if were to do this again we would have stayed longer in Jordan and less time in Israel. Both are expensive, but Israel by far was much more expensive. 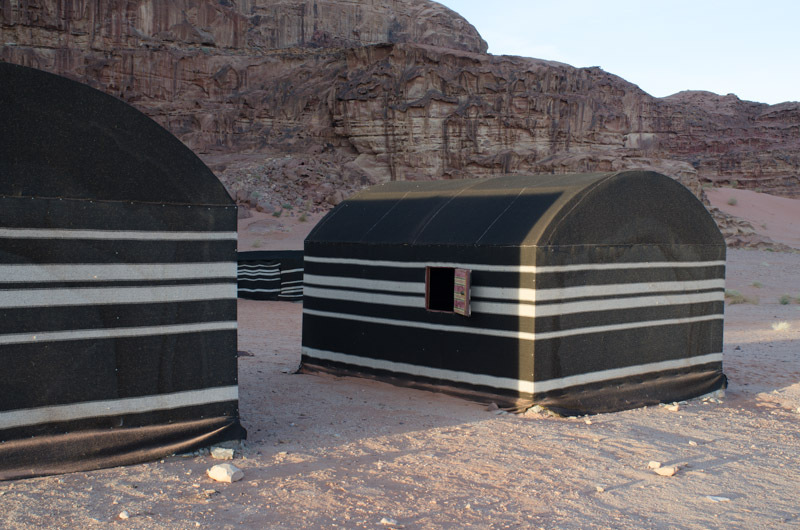 Your money will buy a lot nicer accommodations in Jordan versus Israel. 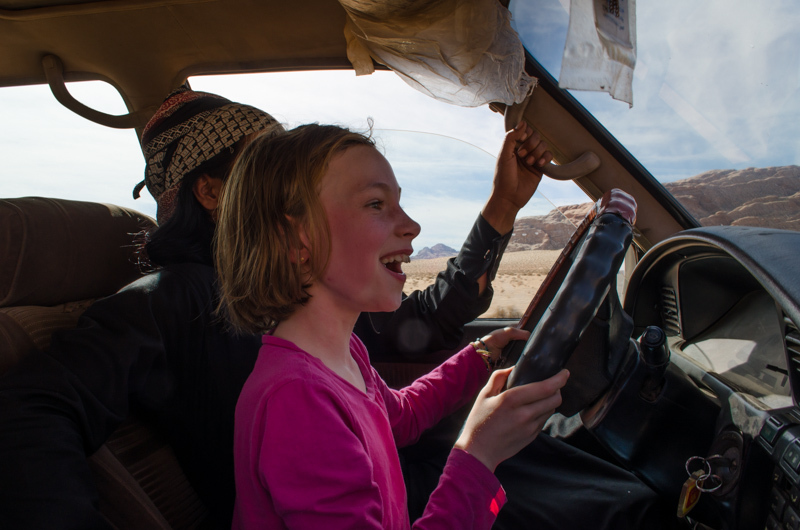 We absolutely loved our time in Wadi Rum and wished we had spent several more days in the Bedouin camp. It was well worth the cost. Always read the small print when booking a hotel. Also if you are using a credit card don’t have the hotel convert it into USD. The exchange rate will likely be very poor. Don’t be afraid to rent a car in Jordan. Driving in Jordan is easy with great roads and the gas was the cheapest we have seen since leaving on our around the world trip. Sometimes budgets are just that, a budget. Sometimes it is okay to splurge. Despite our budget woes this month, we saw some amazing places and had a wonderful time. However, it really goes to show the slower you travel the cheaper the costs. This is Sydney’s Mom. I must apologize on the delay in getting this posted, as we had a tragedy…I accidentally overwrote Sydney’s blog with my own. Now on to the post. 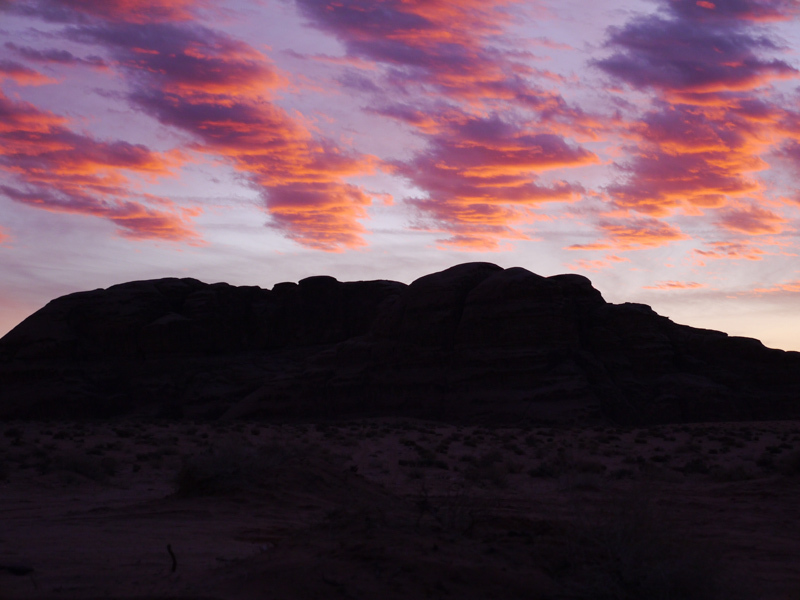 Wadi Rum is also known as the valley of the moon. 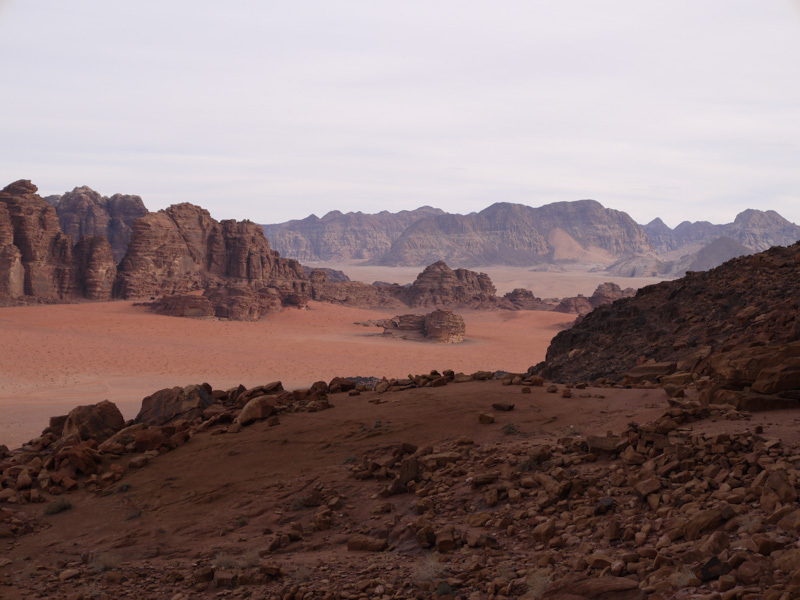 Wadi Rum is in Jordan. Wadi Rum is a UNESCO World Heritage Site. Now on to the adventure. 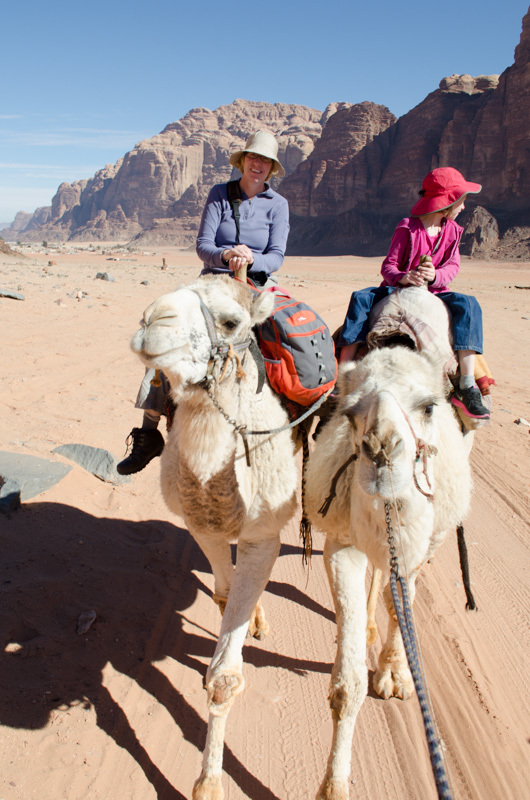 When we came to Wadi Rum we rode camels for 3 hours. We stopped at a nice little spot and had a delicious lunch. We got back on our camels and started riding again. Like an hour later we arrived to camp. We had a yummy dinner at the camp. The dinner was cooked underground. 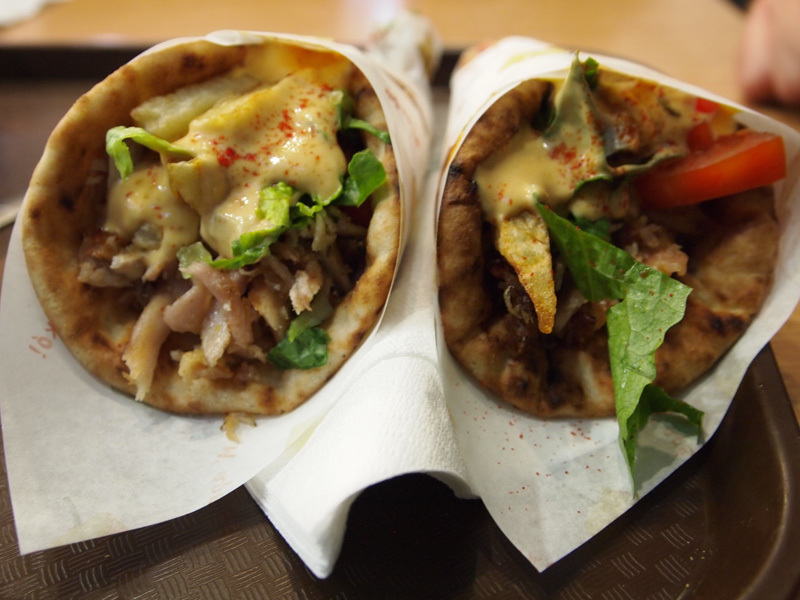 We had chicken and rice with pita bread and humus. We had a nice night. 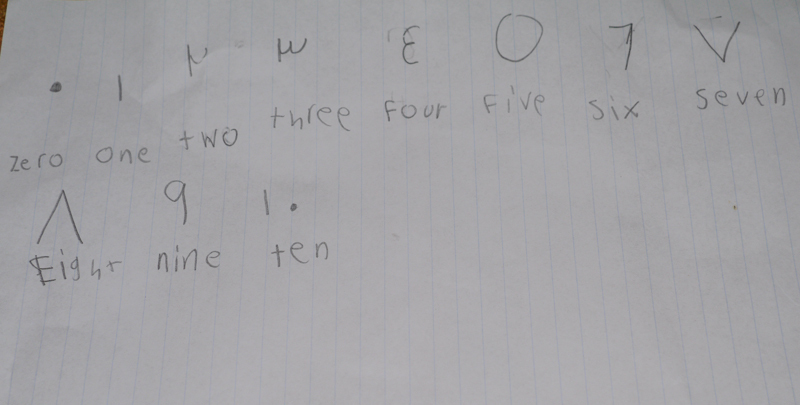 I learned how to count and write my numbers in Arabic. I slept in a tent. When we woke up we had a gorgeous breakfast of pita bread, humus, and cheese. Then we went on a jeep ride. We were going to this rock bridge when our guide asked, “Want to drive?” I said, “Yes” thinking I would pretend to drive. I was wrong. The guide started the car and I drove it by myself with help. I did a blind corner all by myself. We were going about 20 or maybe even 25 miles an hour. 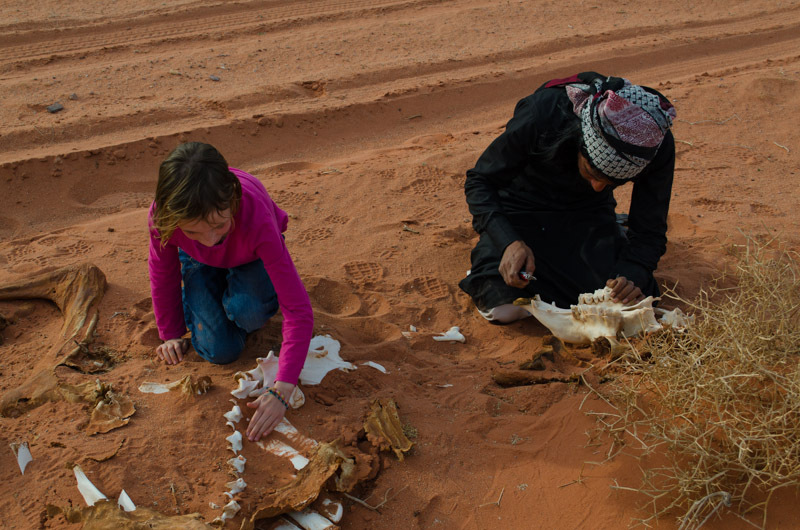 We also found a skeleton of a camel and stopped the car. It had some leather on it. 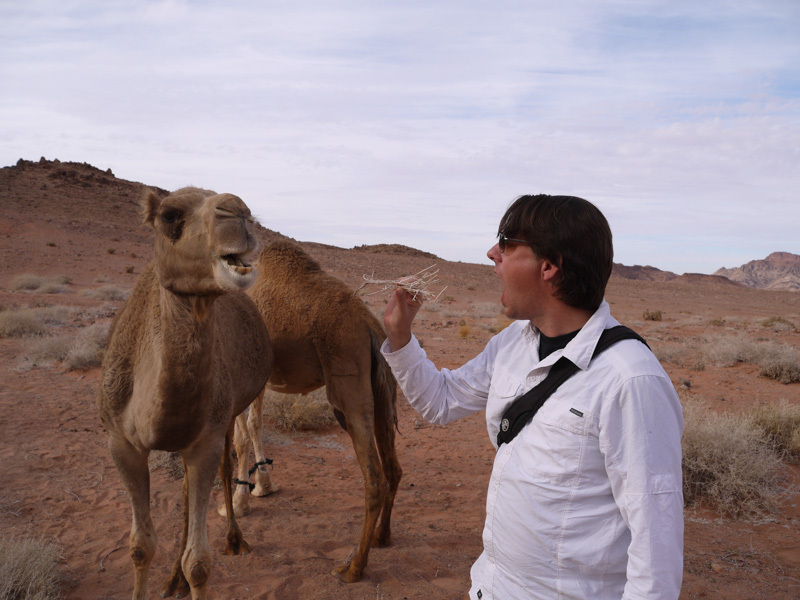 Our guide did a little dentist work and pried out 2 of the camel’s teeth. The teeth are really cool. 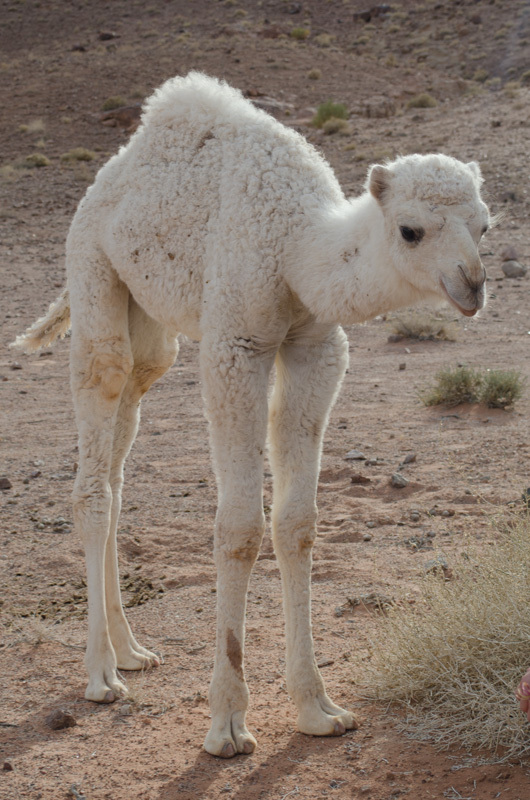 The guide also showed me these cute little baby camels. I managed to get one of the baby camels to eat out of my hand. The others were too shy. My favorite camel was the one that ate out of my hand. I named it “Jewel.” I also got to herd goats. It was fun. 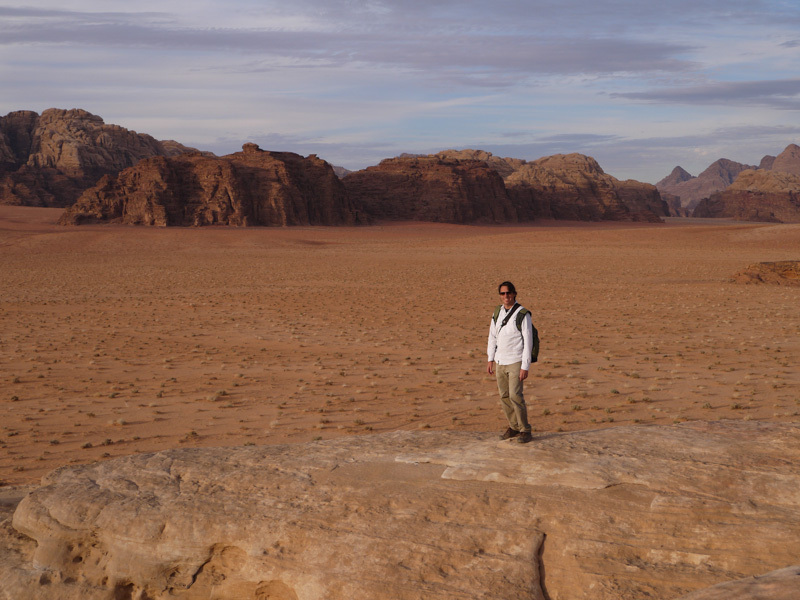 Now you know all about my adventures in Wadi rum. 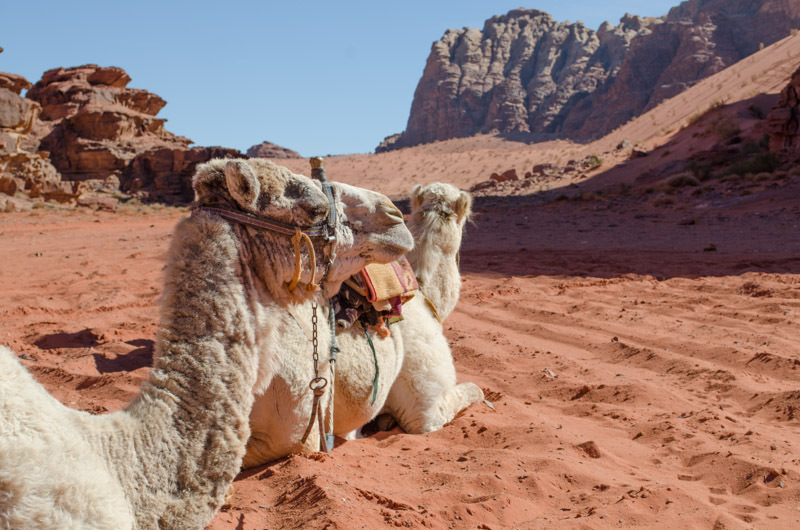 At the mere mention of Jordan, Petra immediately comes to mind with its’ ancient tombs carved into sandstone rock, camels and eroded canyons. 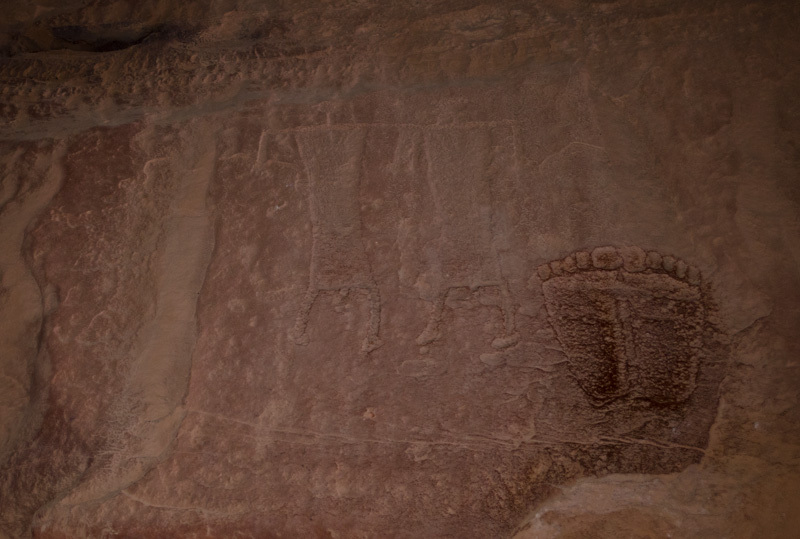 But there has got to be more to Jordan than just one ancient site, right? In searching our guidebook to answer this question, photos of Wadi Rum immediately jumped out at us. Upon seeing the stunning beauty of the place reflected in these pictures, it intrigued us so much that we knew that we needed to add this to the list of places to visit. Normally we are not a family who goes on guided tours. 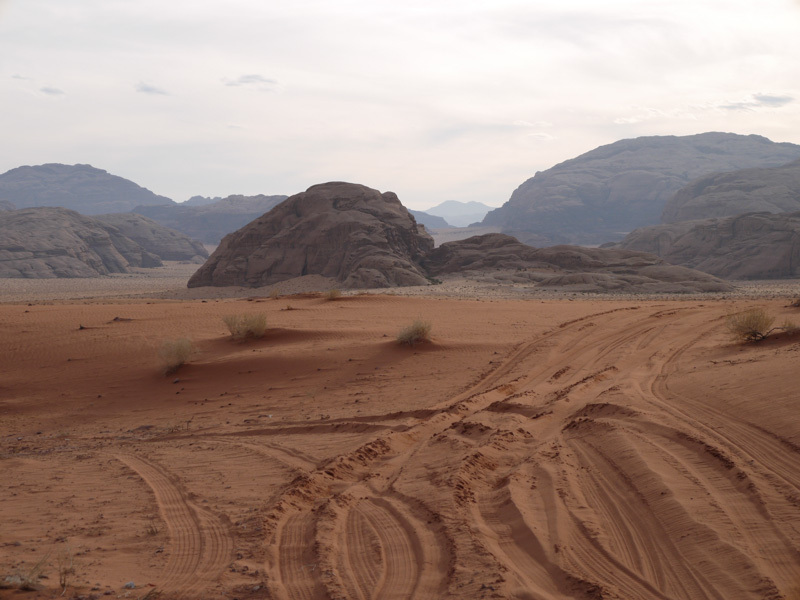 However, after reading more about Wadi Rum we decided that it was not a place that can easily be accessed without a guide. 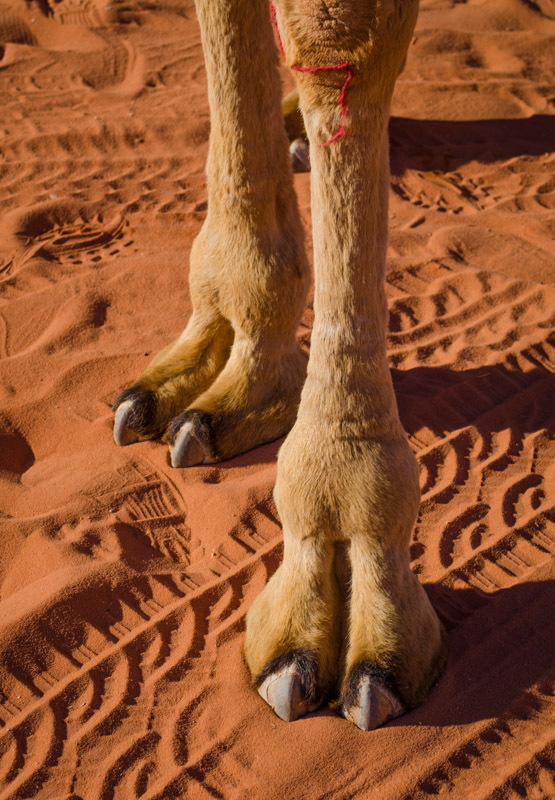 So after a lot research, we decided to go on a camel and jeep trek with a 2-night stay in the desert through Rum Stars Camp. 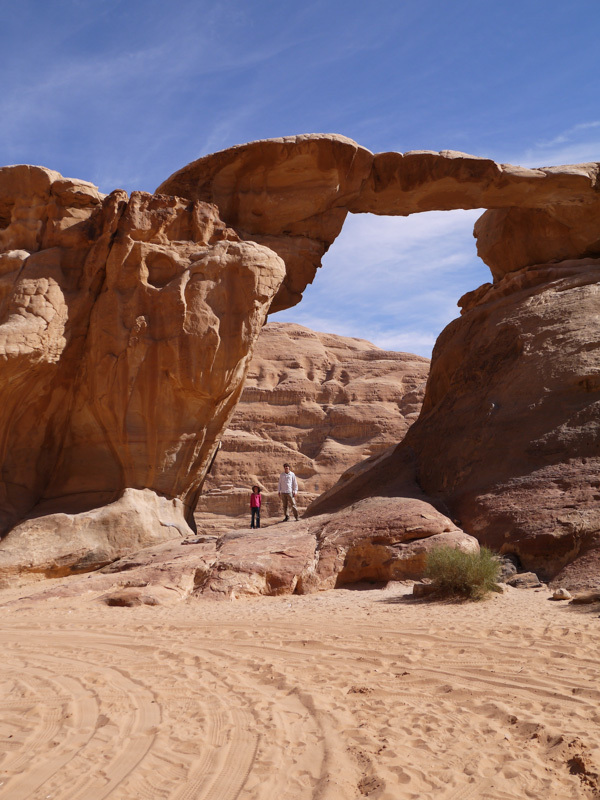 On the day of our desert trek, we drove from the Red Sea resort town of Aqaba to Wadi Rum full of anticipation. 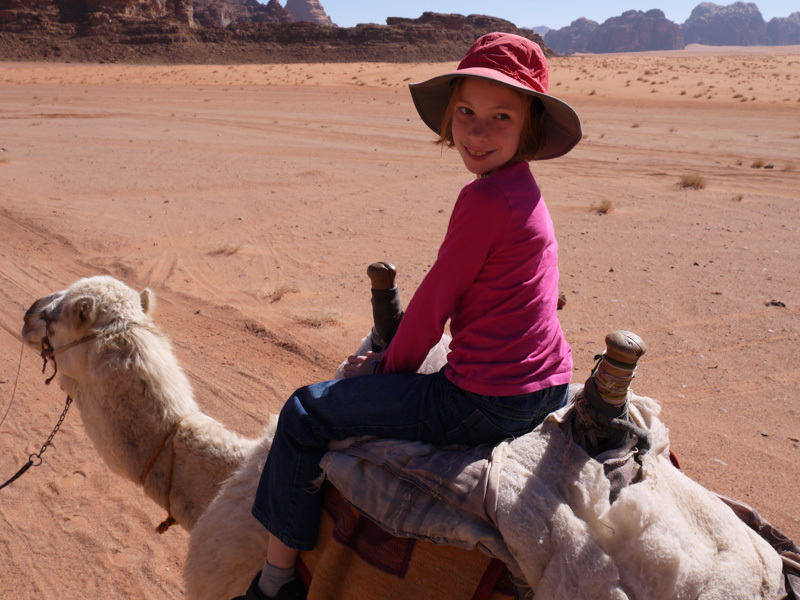 Our daughter, Sydney, was especially excited about riding camels. After arriving at the Wadi Rum village one of our Bedouin guides greeted us with tea. We enjoyed sipping our tea while the guide discussed with us what the plan was for the next couple of days. 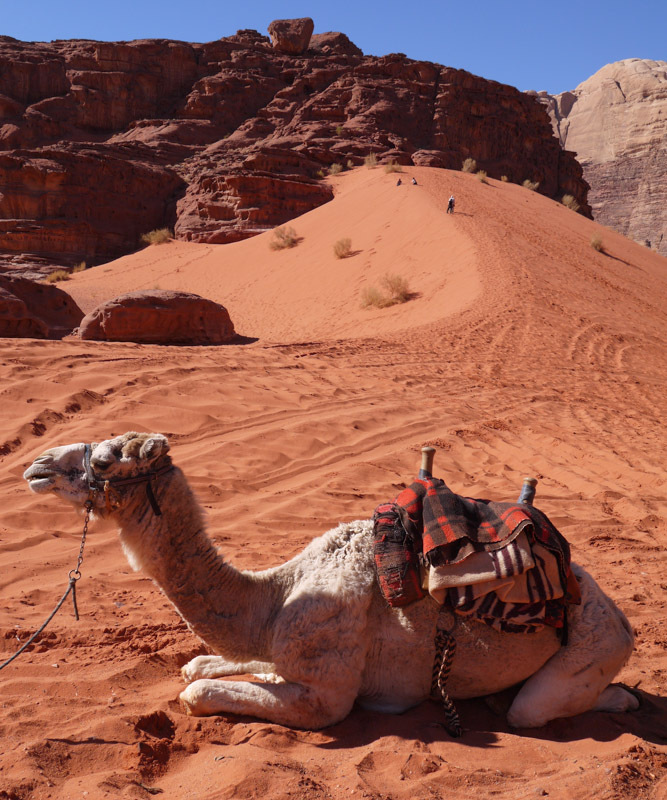 Afterwards, we were whisked off on camels into the desert of Wadi Rum. I must confess here that the camel riding was the one activity I was the least enthused about. I really don’t like riding horses and riding a camel has got to be like riding a horse, right? But Sydney had wanted to ride a camel since Morocco and we figured this would probably be the best place to do this. Thankfully, riding a camel is nothing like riding a horse, whereas when riding a horse after 10 minutes every part of my body starts aching and the rest of the ride becomes all about longing for that moment when I can get off. Riding a camel is very soothing, almost hypnotic, with a gentle back and forth swaying motion. 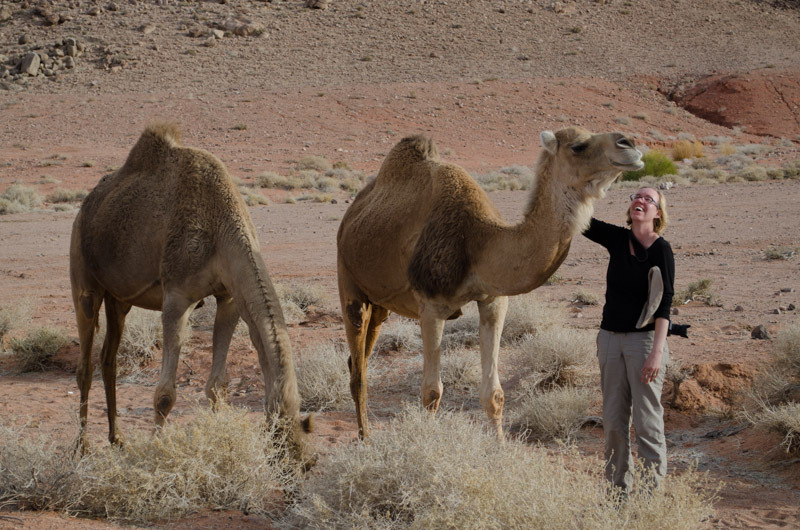 I am glad that we decided to do the daylong camel trek as it allowed us to absorb the beauty of the desert and the profound peace from a comfortable perch. 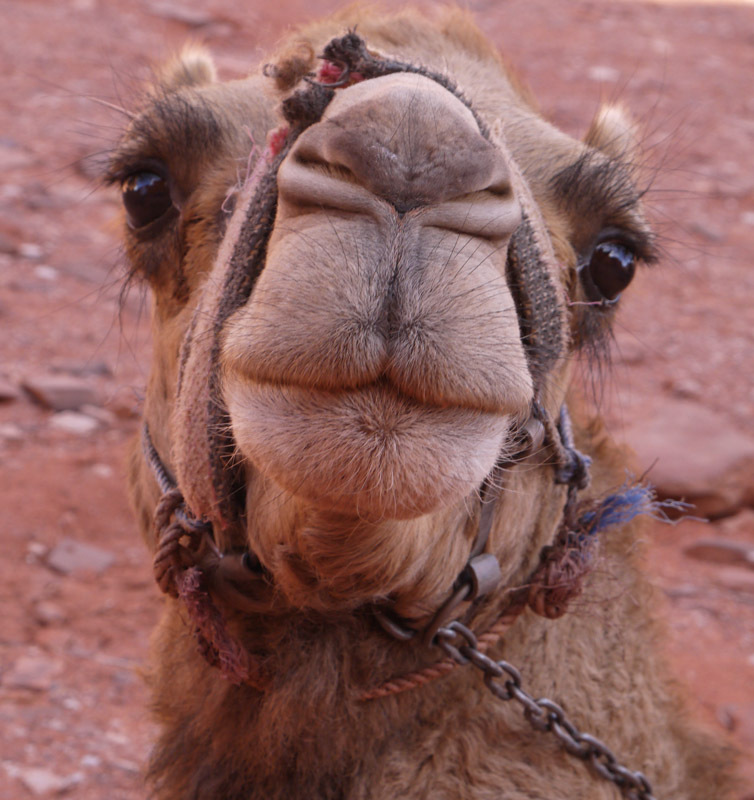 I must also confess that camels now have a soft spot in my heart. They are surprisingly expressive and are very cute with their long lashes, knobby knees, cute toes, and big flappy lips. After a day of exploring the desert, eating a delicious lunch with more tea and riding camels, we arrived in the evening to our Bedouin camp. The guides made a delicious traditional Bedouin dinner called zorb, which is meat and vegetables cooked underground. Afterwards, we enjoyed sitting around the campfire while our guide Salem talked about the life of a Bedouin. Salem has 13 brothers and sisters and his father has 2 wives. He explained that life of a Bedouin is a simple one with little material wealth. Although there maybe little material wealth, most decide to continue with that life even when there are other opportunities available. After our delicious dinner and campfire discussion, we headed out for some stargazing. I must say I have never seen stars like I have in the desert of Wadi Rum. We woke up early the next day and enjoyed a typical Middle Eastern breakfast of tea, humus, cheeses, pita bread, olives, cucumbers and tomatoes and then set off on the jeep tour. 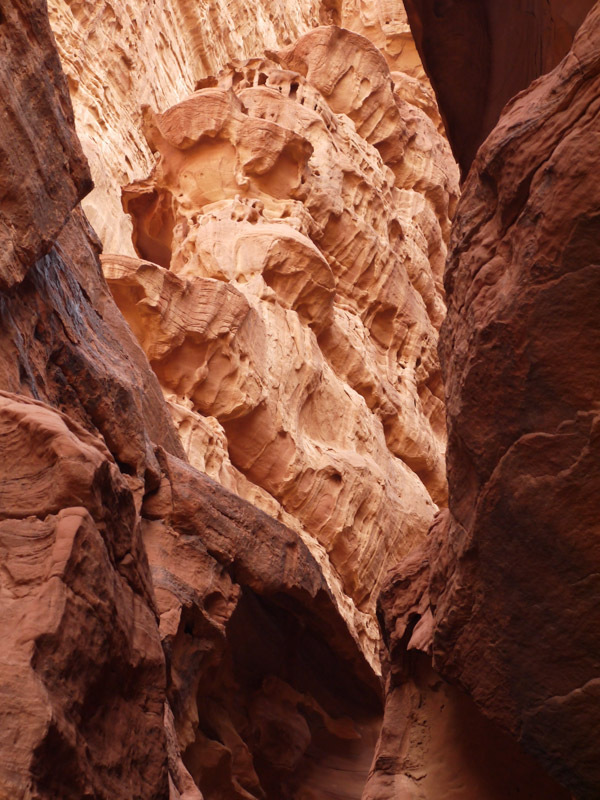 During the day we got to hike through beautiful red sandstone canyons eroded by time, scramble up rocks, see ancient petroglyphs, eat another delicious lunch, drink more tea, and watch the sunset over Wadi Rum. However, the highlight of our day was being able to see baby camels. 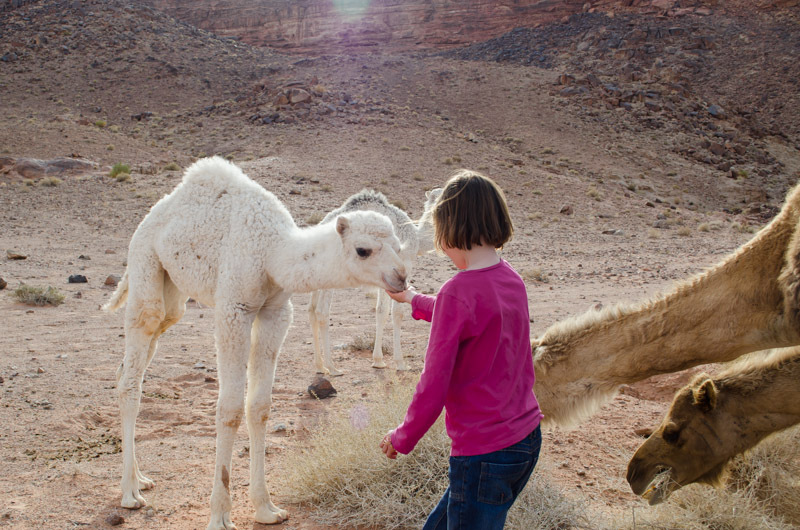 Our guide, Salem, upon finding out that Sydney loves animals and wants a farm when she grows up, drove until he was able to find his cousin’s camel herd to show her the newborn camels. Along the way he spotted a camel skeleton and immediately stopped the jeep. He then jumped out and chiseled out two camel teeth for Sydney. Sydney is very proud of her teeth. However, I am hoping that this will not become an issue when we travel to other countries as Sydney is rather attached to her camel teeth now. With all good adventures, it must come to and end. 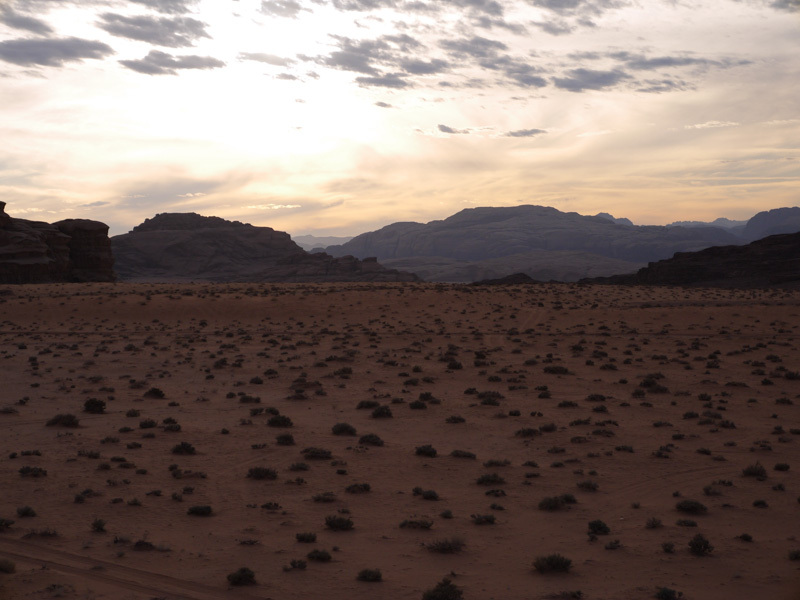 After 2 nights in the desert, an amazing camel trek, and jeep tour, we returned to the village of Wadi Rum. However, before leaving Salem introduced us to his youngest brother Abduhl, age 7, whose responsibility it is to herd the goats. Sydney and Abduhl had fun playing together and chasing and catching baby goats. Sydney and I also had the opportunity to get a glimpse of the traditional Bedouin life. Just as we were about to get into our car to leave the village of Wadi Rum, Sydney and I noticed some children peeking out behind a gate giggling. We were waving at them when they motioned for us to come in. We were then invited into the house to share tea with the women and children. Unfortunately Sydney and I don’t speak Arabic and they spoke very little English. At first I felt awkward and uncomfortable with the silence and kept wondering how many wrong things I was doing. But I than began to relax and just enjoy the unique moment in time. 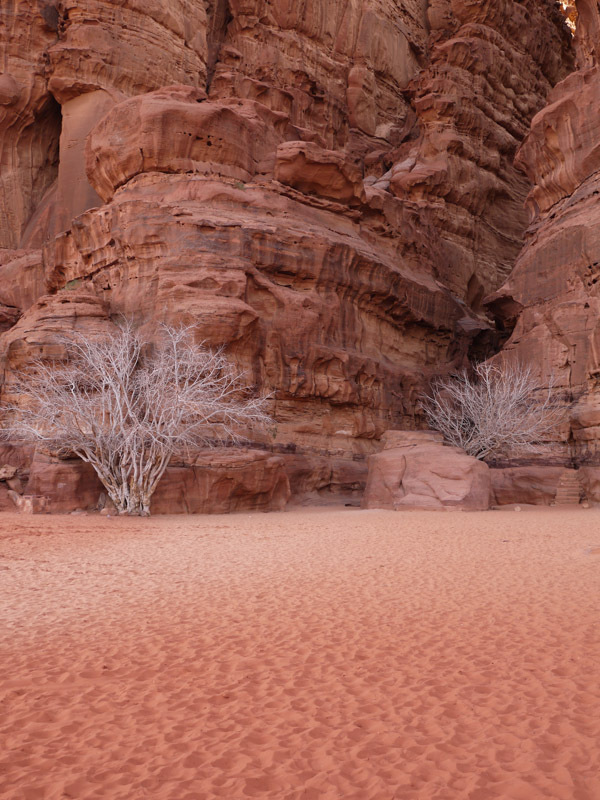 Wadi Rum has by far been one of the highlights for us on our around the world adventure. 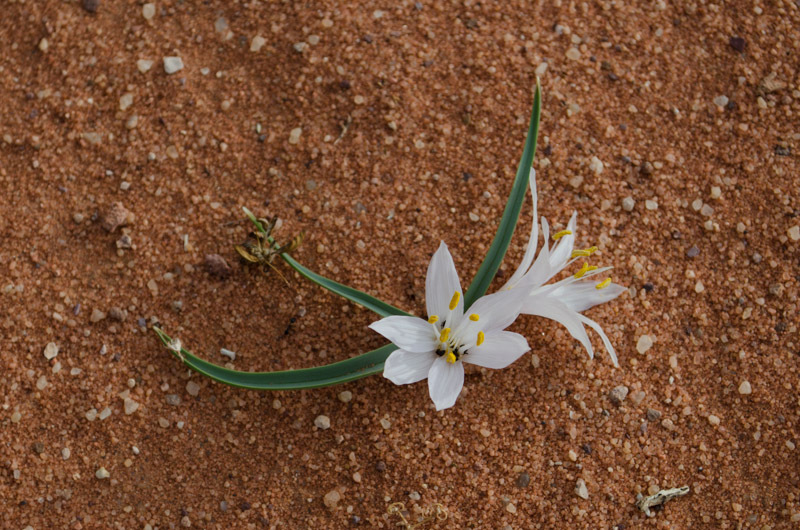 While there I began to appreciate how much life there is in the desert. There is much more life than what first meets the eye. It is spring right now and there are flowers blooming. On our hike, we noticed fox, rabbit and possibly wolves’ tracks in the sand and saw tiny green lizards scurrying about. However, it is still difficult for me to comprehend how the Bedouin are able to survive in a land that seems so inhospitable. 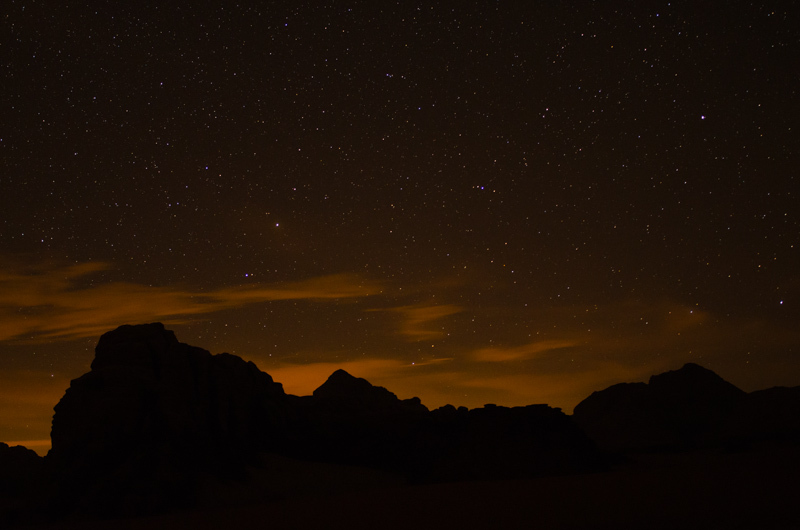 I have never seen so many stars in the night sky than in Wadi Rum and never been in a place that is so absolutely devoid of noise. It was so quiet that it was almost deafening. 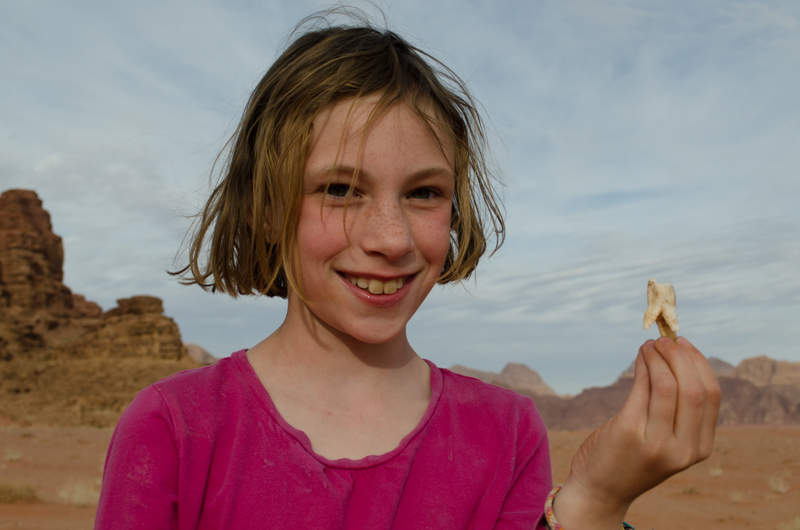 During my time in Wadi Rum, I was also struck by the level of responsibility that the Bedouin children have. While living in Portland, I would have never dreamed of sending Sydney at the age of 7 down the street to the store. 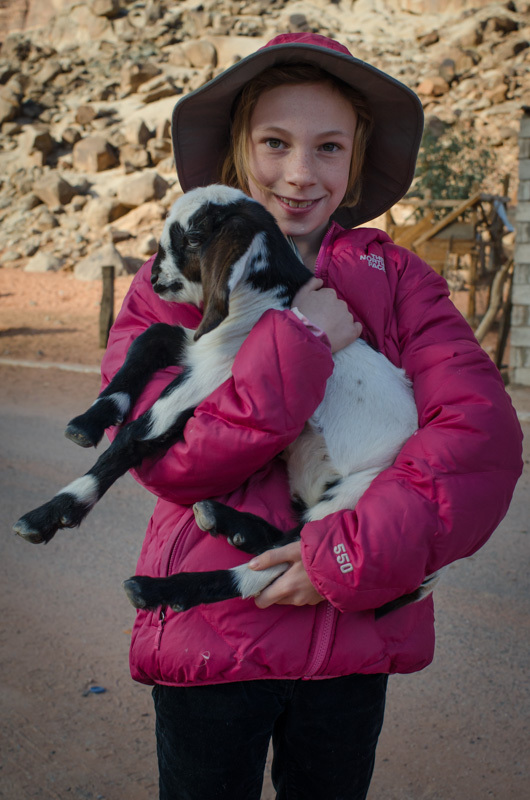 However, Bedouin children every day go out into the desert to herd the goats by themselves. What an amazing, unique, but different life from my own. Jordan has struggled economically within the last couple years with the wars in Syria and Iraq and the influx of refugees. Talking with others, tourism has dropped significantly due to this. But despite these woes, we were warmly greeted and felt incredibly safe while in Jordan. 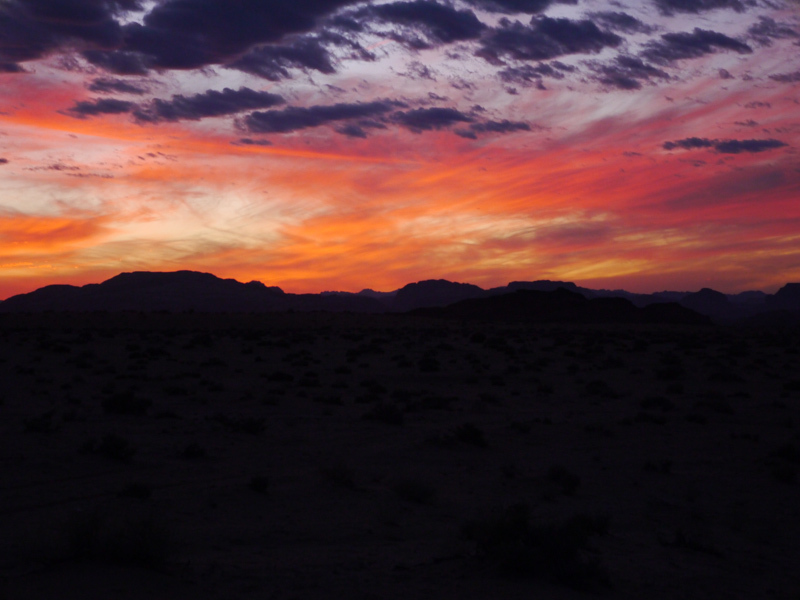 My only regret is we did not have more time to stay in Wadi Rum. 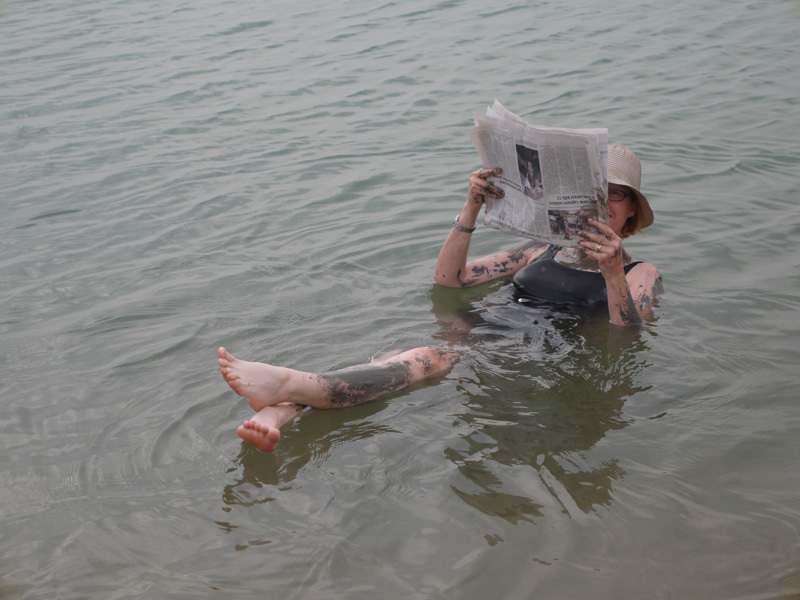 Before leaving Jordan we had to experience the Dead Sea. Floating in it is the strangest sensation. You cannot sink no matter how hard you try and you totally feel like a cork. After a fun day of playing in the Dead Sea we were rewarded with this amazing sunset. During our first 2 days visiting Petra I was not happy with the photos I was taking of Petra’s most iconic structure, the Treasury. On our second day visiting the site I noticed a person high up on the cliffs above the structure and I knew that I had to get up there. On the morning of our third day we spoke to several guides about how to get up there and found that there is a stairway that leads to the top. 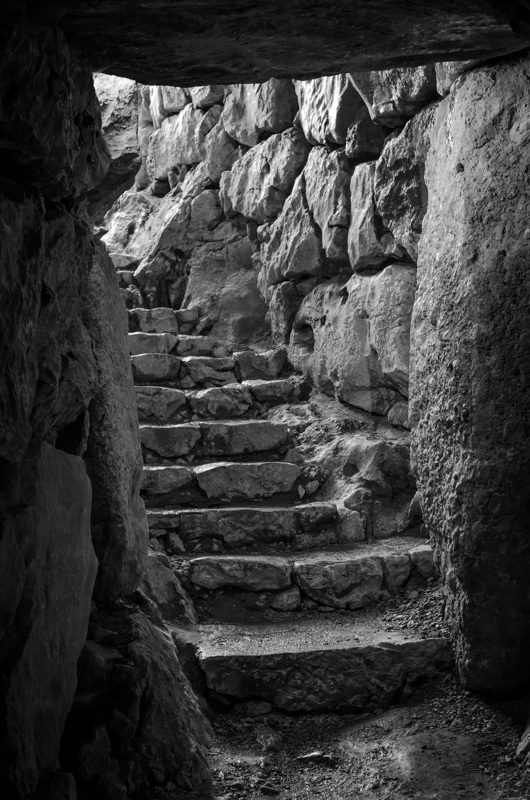 We followed the guides directions and found the ancient and heavily worn stone stairway leading up. 700 steps later we arrived at the top and then had to traverse through brush and rock to get to the lookout we sought. Upon reaching the spot we found a small shelter and two Bedouins enjoying morning tea. They invited us into their shelter and offered us tea. Here is the photo from that spot.